By studying minute inclusions trapped within blue diamonds, scientists have been able to determine that their origin is far deeper in the Earth than other diamond varieties. The journal Nature recently revealed that blue diamonds form about 400 miles below the surface, four times deeper than about 99 percent of all other diamonds. “We knew essentially absolutely nothing about where they grow,” said geologist Evan M. Smith, a lead author of the Nature report and a research scientist at the Gemological Institute of America in New York (GIA). Smith and his colleagues investigated this question by reviewing 46 blue diamonds that were submitted to the GIA. The team focused specifically on other minerals trapped within the blue diamonds. To gem cutters, inclusions are flaws, but to geologists, they are clues. “If you had to design the perfect capsule to bring something from below, a diamond would be it,” said geologist Jeffrey E. Post, curator of the mineral collection at the Smithsonian's National Museum of Natural History, who was not involved with the Nature report. The creation of a blue diamond requires a complex geologic sequence. Geologists determined that trace impurities and contamination with the element boron, turn diamonds blue. A boron atom can replace a carbon atom in the crystal structure. A loose electron from boron absorbs red light, giving the diamond its blue hue. Because boron exists in seawater, Post hypothesized that the rocks in descending crust carried the boron below, as if the element were on a boat ride to the lower mantle. “That is a good circumstantial bit of evidence, at least,” he said. Within the inclusions, Smith identified remnants of calcium silicates and other minerals that form only at extreme high pressure. He noted that as the diamonds worked their way back toward the surface, the high-pressure minerals within became unstable and shattered, leaving fragments stuck in the diamonds. An analysis of these ruptures, plus the list of minerals found in the inclusions, pointed to a very unusual birthplace. Smith explained that it required the union of two rocks: oceanic crust from the surface and the underlying ocean mantle. That is a match made in the abyss — where the motion of tectonic plates forces a slab of ocean crust to descend like a conveyor belt for hundreds of miles. Appearing in nearly every color of the rainbow, colored diamonds are extremely rare, but blue diamonds are considered the rarest. Recent survey research indicates that of 13.8 million diamonds found, only 0.02 percent were blue. Perhaps the most famous blue diamond in the world is the legendary Hope Diamond, which resides at the Smithsonian in Washington, D.C. The fancy dark greyish-blue diamond weighs 45.52 carats and is estimated to be worth more than $250 million. Blue diamond discoveries are still very sporadic and are considered astonishing occurrences. And they still make headlines. In November 2015, Hong Kong businessman Joseph Lau purchased "The Blue Moon of Josephine,” a 12.03 carat blue diamond, for $48.4 million. The gem was named after Lau’s seven-year-old daughter. In May 2016, the world's largest blue diamond, “The Oppenheimer Blue,” a 14.62 carat gem, won the title of the world's most expensive blue diamond ever, selling for a jaw-dropping $57.5 million. 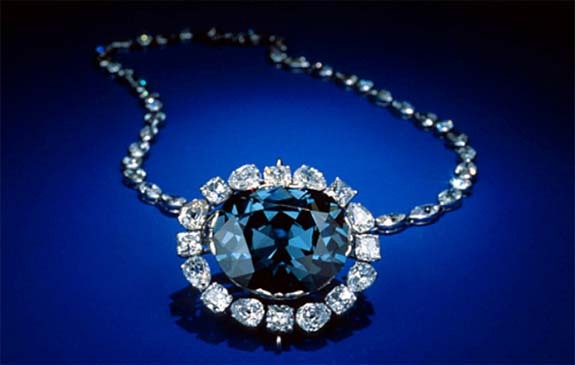 Photo Credit: The Hope Diamond, Smithsonian Institution. Stanley Jewelers Gemologist of North Little Rock, AR, has a proud tradition of three generations of fine jewelry and fine service in the South. Charles B. Stanley began as a watchmaker in downtown North Little Rock in 1936, until he and his wife, Sally, opened a small jewelry store which has grown and today stands on beautiful Park Hill. Owner Loyd Stanley, CGA, feels that the service and attention you'll receive at Stanley's set the store apart from the crowd of jewelry stores. American Gem Society members since 1966, Stanley's is proud of its reputation as leaders in quality, ethics, and education. Three Graduate and Certified Gemologists are available, as well as a qualified jeweler and two watch repairmen, one who spent seven years with Rolex.